And the full page newspaper propaganda ads begin. Amongst the jargon and rhetoric they are telling us to join them on the 'consultation journey' and that they're actually going to significantly 'increase community green space' by developing on top of it with commercial premises (incredible, sounds too good to be true!) and so much more. ASF are saying that the project for certain 'will include a cruise ship terminal' and they are seeking to bring 'a new energy' to the area. The community would be forgiven for having some vast and serious doubts here at this blatant attempt to present what is essentially a picture and idea of a project that is fundamentally not the project they are planning. Their incredible and far stretching claims can not be scrutinised, confirmed, checked, analyzed, moderated, verified as they have seriously no case or argument for any of this at all - ie they can not be trusted! 'Think of the jobs!!!' is the argument - and that seems to be about it. But they are happy to move right into consultation and surveys it seems (hang on we've done this over and over and the results have always been a massive majority NO from the community), despite there clearly being no information available at all other than their loose claims, for anyone to actually make an informed decision. They have just handed out blindfolds to the entire Gold Coast and are now gently shoving the blinded community and councillors towards the edge of the cliff. And then finally the fine print says it all really - they are happy to force upon us the white elephant above, but then slip it in the fine print that, well, all of what they are saying and showing, may in fact be incorrect and that if it is wrong, it's not their fault. SERIOUSLY WHO DO THESE GUYS THINK THEY ARE? ASF Consortium are a Chinese owned group of companies, consisting of "ASF Group, China Communications Construction Company, Guangzhou Dredging Co Ltd and China State Construction Engineering Corporation Limited." according to the Broadwater Marine Project website. 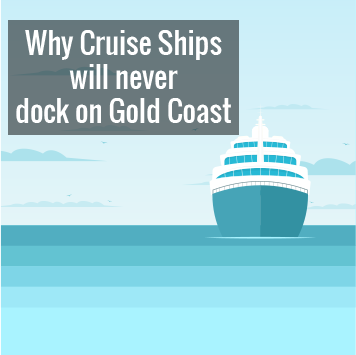 As written in the Gold Coast Bulletin, China Communications Construction Company (CCCC) is said to be the largest port construction and design company in China. Guangzhou Dredging (GDC) is a subsidiary of China Communications Construction Company and is one of the largest companies in the world specialising in dredging and reclamation of land. CCCC is "state-owned" as in it is owned by the Chinese Government. Both companies form the bulk of, and are the controlling entities in the ASF Consortium. 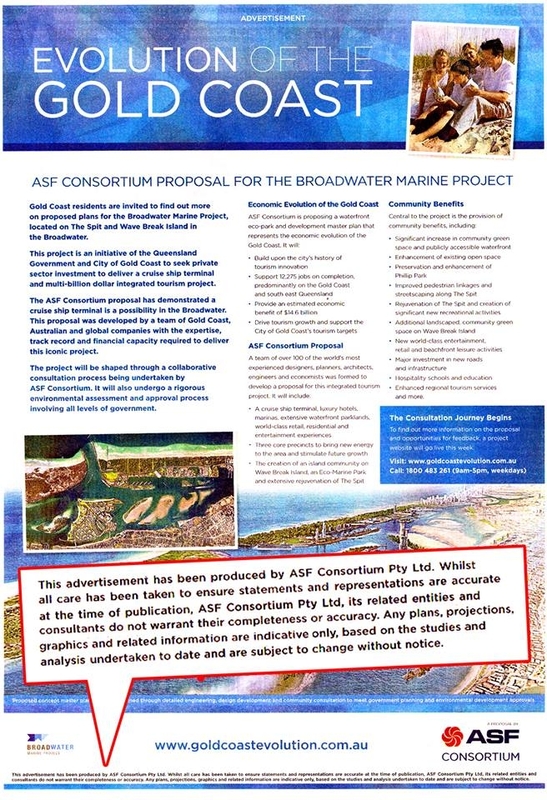 In this case (the Broadwater project) ASF consortium could easily be construed as a simple cover name for the aforementioned companies to mask themselves and hide their true background and identity from the average person. In 2011 both companies (CCCC and GDC) formed part of a group of seven companies that were the main focus of one of the World Bank Integrity Vice-Presidency’s most significant ever investigations. The fraud and corruption investigations centred on the companies involved allegedly colluding to generate false competition, drive contract prices up and pre determine the awarding of lucrative infrastructure projects in the Philippines. The project in question was a Public / Private partnership called 'the Philippines National Roads Improvement and Management Program' – which was funded by the government, the World Bank and other private interests. Under the 2010 Agreement for Mutual Enforcement of Debarment Decisions they have also been debarred by the African Development Bank, The European Bank for Reconstruction & Development, the Asian Development Bank, The Inter-American Development Bank and the World Bank Group. Even after appealing, the World Bank upheld it’s findings and determined that the evidence was clear that the companies had colluded in a fraudulent manner to manipulate the tender process in the public/private partnership project for the Philippines National Roads Improvement and Management Program. Leonard McCarthy, World Bank Integrity Vice President said, "This is one of our most important and far-reaching cases, and it highlights the effectiveness of the World Bank's investigative and sanctions process." Asked if the companies listed had the right to appeal, World Bank Spokesman David Theis told China.org.cn, "All firms listed in the release had the right to contest the debarments as part of the World Bank's sanctions process, and did so. The bank's sanctions board (both internal and external members) then evaluated the pleadings of the Respondents against the evidence from the bank's investigative office. The release today shows the board's decision." CCCC is the designated successor entity to China Road and Bridge Corporation (CRBC), which was debarred by the World Bank for eight years, beginning January 12, 2009. Despite the ban the company was controversially contracted to construct the four-lane 51.4 kilometre Kampala-Entebbe Express Highway in Uganda funded with money from the Exim Bank of China. CCCC is controlled by the central government's State-Owned Assets Supervision and Administration Commission, it was created Oct. 8, 2006, with the merger of state-owned China Harbour Engineering Co. and China Road and Bridge Corporation. China State Construction Corporation, China Road and Bridge Corporation (CRBC, SH:600263) and two other Chinese construction companies were debarred from bidding for World Bank financed projects for periods ranging from five to eight years, after a corruption investigation in the Philippines, according to a Bank press release. The companies were among seven firms and one individual debarred for 'engaging in collusive practices under a major Bank-financed roads project in the Philippines", according to the World Bank press statement. The project, the Philippines National Roads Improvement and Management Program was partly financed by a US$150 million loan from the World Bank. An investigation by officials from the World Bank Integrity Vice-Presidency (INT) and external legal experts determined that the companies had colluded to enter non-competitive, artificially high bid prices, the Bank statement said. CRBC is the overseas arm of state-owned giant China Communications Construction Company Ltd., which is ranked 426 in the Fortune 500. The other Chinese companies barred are China Wuyi Co Ltd (SHE:000797), barred for six years, and China Geo-Engineering Corp, which was barred for five years. A Philippine company, E.C. De Luna Construction Corp and its owner Eduardo le Luna were permanently disbarred from bidding for World Bank projects, the strongest possible sanction applied by the Bank. A Korean company, Dongsung Construction Company Ltd had already been debarred for four years for fraudulent and corrupt practices in relation to the same case, according to the Bank's press statement. There are hundreds of pages all over the internet on CCCC, a lot of them are very interesting indeed, here's some of the one's we used to get informed here. they are respectable websites of the highest order, this is some very serious stuff.